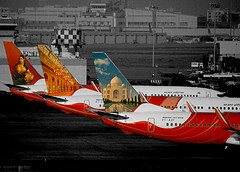 Airliners-India :: View topic - Difference between aircraft variants? Posted: Thu Jan 24, 2013 11:56 am Post subject: Difference between aircraft variants? This is my first post on this forum and wasn't sure where to ask this query. Apologies in advance if this isn't the right place to ask the question. I understand the differnce between different variants of an aircraft like 737-700 and 737-800. However, I am unable to understand how a 737-85R is different from say 737-8HX. I tried to search for answer a lot albeit unsuccessfuly. Posted: Thu Jan 24, 2013 5:47 pm Post subject: Re: Difference between aircraft variants? Whenever Boeing sells an aircraft, they replace the last two numbers of the model number, such as B737-800, with the customer code that Boeing assigns to every carrier it sells it's aircraft.. Customer configuration determines the last two digits.......All types need not be similiar......they can have customer chosen variables.